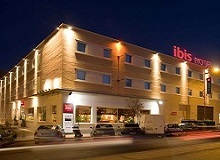 The Ibis Hotel in Getafe is located in the south of Madrid, 5 minutes from Parquesur, the third largest shopping center in Spain. The rooms have been designed to ensure you enjoy a relaxing stay, featuring air conditioning, heating, television and WIFI. The Hotel Ilunion Atrium is located in Madrid's business district, half-way between the airport and the city centre, making it an extraordinary choice for any trip the Spain's capital city. 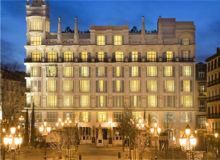 The NH Madrid Nacional hotel has a central spot on one of Madrid's most prestigious avenues, the Paseo del Prado. It's in the Art Triangle, home to 3 world-famous art museums. The 1920s building itself is beautiful too, designed by architect Modesto Lopez Otero. The ME Madrid Reina Victoria is strategically located in the heart of the city, with easy access to the major attractions The impressive facilities include "The Roof" where you can admire the most spectacular views of Madrid. Accessible rooms have walk in showers and grab rails. Housed in a historic building in the heart of Madrid, the Iberostar Las Letras Gran Via hotel is the ideal place to discover and blend in with the city as you can easily reach the main tourist attractions on foot. 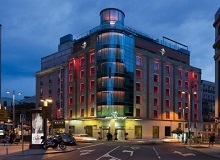 Hotel Santo Domingo is located in the heart of Madrid, within 150 yards of Gran Via and the Santo Domingo Metro Station. It features a sunroof terrace with a swimming pool and views of the city. The rooms are individually decorated, and offer free WiFi. The Hotel Paseo del Arte is a 4 star hotel located in the centre of Madrid, just 100 meters from the Puerta de Atocha train station. Located in the privileged surroundings of the "Art Triangle", comprising the Prado Museum, the Thyssen Bornemisza and the Reina Sofia Centre of Art. 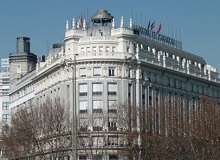 The Hotel Regina Madrid is located amongst a street of very ornate buildings. The road it is on stretches between the Puerta del Sol in the heart of Madrid, to Retiro Park. The entire street is filled with majestic architecture and the Hotel Regina is no exception. Situated in the historical center of Madrid, close to the major sights and attractions of the city such as Puerta del Sol, Plaza Mayor, the Royal Palace and the Prado Museum, Thyssen-Bornemisza and Reina Sofia . Also, it is in the trendy tapas and restaurants area (La Latina, Cava Alta and Mercado de San Miguel).